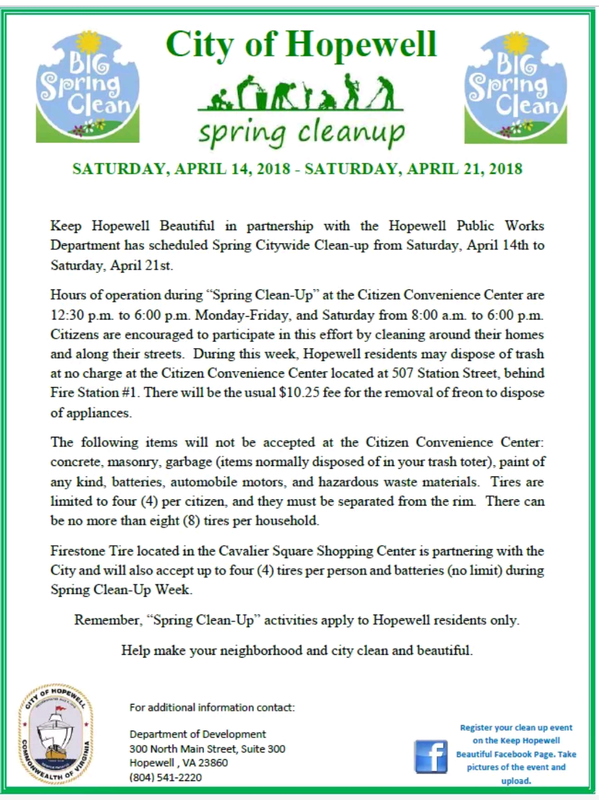 Keep Hopewell Beautiful in partnership with City of Hopewell Public Works Department has scheduled Spring Citywide Clean-up from Saturday, April 14 through Saturday, April 21. This event is for Hopewell residents only. Hours of operation during “Spring Clean-Up” at the Citizen Convenience Center are 12:30 pm to 6:00 pm Monday-Friday and Saturday from 8:00 am to 6:00 pm. Citizens are encouraged to participate in the effort by cleaning around their homes and along their streets. 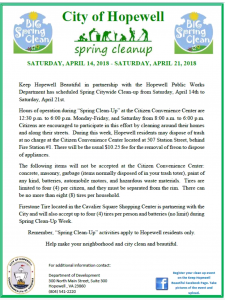 See picture below of the City of Hopewell flyer for complete details. For additional information contact City of Hopewell Department of Development staff at (804)541-2220.